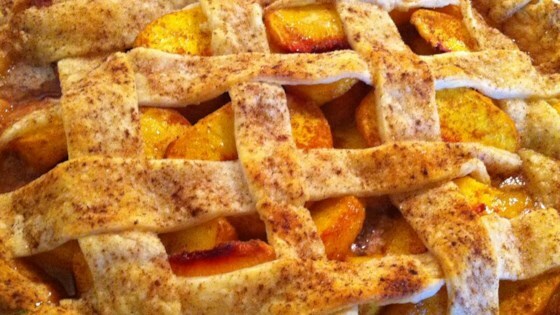 "Old fashioned peach pie using no eggs, my family's favorite." Mix flour, sugar and butter into crumb stage. Place one crust in the bottom of a 9 inch pie plate. Line the shell with some sliced peaches. Sprinkle some of the butter mixture on top of the peaches, then put more peaches on top of the the crumb mixture. Continue layering until both the peaches and crumbs are gone. Top with lattice strips of pie crust. Bake at 350 degrees F (175 degrees C) for 45 minutes, or until crust is golden. Allow pie to cool before slicing. Best when eaten fresh.